Rangers beat Aberdeen to go second in the Scottish Premiership in a match that featured a red card for each side. Jayden Stockley headed wide from Jonny Hayes' cross early in the second half and Rangers quickly capitalised on that miss when Kenny Miller tucked in. A powerful Lee Hodson shot doubled the home side's advantage. The hosts' Clint Hill and Aberdeen's Ryan Jack were each dismissed for two bookings, with Andrew Considine heading a late consolation for the Dons. The Ibrox side had started the day level on points with Hearts but trailing them on goal difference. However, with Hearts held to a draw by Ross County, Mark Warburton's side go two points ahead of the Tynecastle side and remain eight behind leaders Celtic. Rangers had lost at Hearts in midweek while Aberdeen were coming off a 3-0 defeat by Celtic in Sunday's League Cup final, with the Dons aiming to end a 25-year wait for a win at Ibrox. But that run continues with Warburton's side winning by the same scoreline that they lost by at Aberdeen's Pittodrie in September. The visitors had their chances in Glasgow with James Maddison - who scored a stunning free-kick winner in the sides' last meeting - seeing a set-piece effort bounce wide. Stockley got a foot to a Graeme Shinnie cross to draw a save from Wes Foderingham and came close to putting Derek McInnes' side ahead three minutes after the break. Hayes got round his man to cross from the left but Stockley could not direct his header from six yards on target. 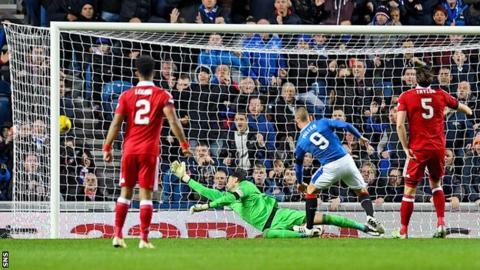 Maddison failed to get a hold of a couple of shots before Rangers' second but the midfielder did deliver the free-kick for Considine's goal. Captain Lee Wallace fired wide in the hosts' best first-half advance and it was the composure of Miller that finally broke the deadlock. Moments after Stockley's miss, 36-year-old striker Miller, deployed in midfield, latched on to Joe Garner's speculative cross and finished first time. Barrie McKay had the vision to find Hodson inside the box amid a spell of pressure and the Northern Ireland international lashed a shot into the roof of the net for Rangers' second, having started ahead of regular right-back James Tavernier. McKay's replacement Harry Forrester forced a save from Joe Lewis as the pressure continued. Defender Hill had earlier escaped unpunished following a risky challenge on Shinnie inside his own box but bookings for fouls on Maddison resulted in the 38-year-old's dismissal. Jack, 24, followed Hill up the tunnel after being cautioned in the wake of a lengthy spell of pushing following a Rangers foul, the Dons skipper having earlier been booked for impeding Michael O'Halloran. And there were further bookings in stoppage time to take the tally to 11. Rangers' Mark Warburton: "The players were more than irked by comments made about them, by comments questioning their battling qualities and their desire. "But they responded really well, there was a lot of nonsense written about them and they more than answered those questions. "First half nobody really controlled the game, it was pretty neutral. But, second half, we stepped on and won second balls and I felt we deserved to win." Aberdeen's Derek McInnes: "From penalty box to penalty box I thought we were the better team. "We really got after Rangers, we pressed them high, we were competitive, we were winning tackles, we were fully committed. I thought we really frustrated them. "But we said to the players at half-time, it was important in the final third to carry more of a threat ourselves,. We got in good areas and rushed that last wee bit. "We had more opportunities to apply pressure with the ball rather than just without the ball, and Rangers scored when we were having our best spell. "We started the second half really on the front foot, got into good areas, still should be doing more with it, but Jayden's is clearly the one we all remember. "It was a good stand-up from Jonny and Jayden would normally eat that type of service up, but he misses. It happens but unfortunately for us it was pivotal." Match ends, Rangers 2, Aberdeen 1. Second Half ends, Rangers 2, Aberdeen 1. Second yellow card to Ryan Jack (Aberdeen). Goal! Rangers 2, Aberdeen 1. Andrew Considine (Aberdeen) right footed shot from the centre of the box to the high centre of the goal. Assisted by James Maddison with a cross. Niall McGinn (Aberdeen) wins a free kick on the right wing. Peter Pawlett (Aberdeen) is shown the yellow card. Lee Wallace (Rangers) is shown the yellow card. Andrew Considine (Aberdeen) wins a free kick in the defensive half. Joe Garner (Rangers) wins a free kick in the attacking half. Second yellow card to Clint Hill (Rangers) for a bad foul. Foul by Clint Hill (Rangers). James Maddison (Aberdeen) wins a free kick in the attacking half. Corner, Rangers. Conceded by Joe Lewis. Attempt saved. Harry Forrester (Rangers) right footed shot from the centre of the box is saved in the centre of the goal. Andy Halliday (Rangers) wins a free kick on the left wing. Corner, Aberdeen. Conceded by Martyn Waghorn. Foul by Joe Garner (Rangers). Ash Taylor (Aberdeen) wins a free kick in the attacking half. Rob Kiernan (Rangers) wins a free kick in the attacking half. Attempt missed. Joe Garner (Rangers) right footed shot from more than 35 yards is close, but misses to the right. Andrew Considine (Aberdeen) is shown the yellow card for a bad foul. Lee Hodson (Rangers) wins a free kick in the defensive half. Corner, Aberdeen. Conceded by Rob Kiernan. Clint Hill (Rangers) is shown the yellow card for a bad foul. Corner, Rangers. Conceded by Mark Reynolds. Substitution, Rangers. Harry Forrester replaces Barrie McKay. Substitution, Aberdeen. Peter Pawlett replaces Graeme Shinnie. Substitution, Aberdeen. Niall McGinn replaces Kenny McLean. Jason Holt (Rangers) wins a free kick on the left wing.